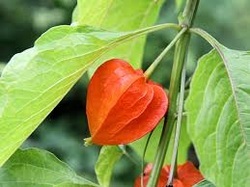 This decorative herbaceous perennial grows well in the shade and produces tasty fruit very rich in vitamin C. The plants produce papery bright-orange calyxes that develop around the ripening fruit earning the plant its common name Chinese Lantern. Plants are aggressive spreaders and will quickly form a a dense ground cover in a shady area. To order this plant please contact us balkanecologyproject@gmail.com. native region: Asia - Caucasus to China. Physalis can become invasive, it is best to plant it in a pot or in a part of the garden that’s contained. It is in flower in July. The flowers are hermaphrodite (have both male and female organs) and are pollinated by Bees. Fruit: raw or cooked. Rich in vitamins, with twice the vitamin C of lemons. Only eat when ripe. Tastes better after a frost. A very ornamental plant though it can be invasive.